In response to the TEXAS WATER CODE 16.058(a), the Texas Water Development Board (TWDB) and the Texas Parks and Wildlife Department (TPWD) have prepared a report on the effects of freshwater inflows on Texas bays and estuaries. 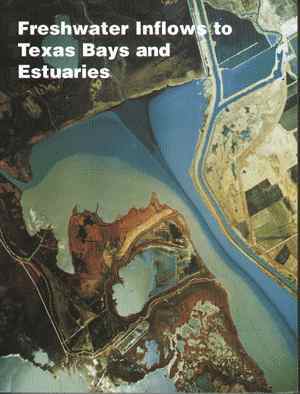 Two main themes are examined in the report: demonstrating the effects of freshwater inflows on living and non-living components of estuarine ecosystems; and presenting a methodology for assessing the freshwater inflow needs of Texas bays and estuaries that satisfies the requirement on maintaining an ecologically sound environment and the productivity of fish, shellfish, and other estuarine life. The first chapter of the report provides an historical perspective on freshwater inflows. Thirteen different functions of freshwater inflows have been identified in various studies. Some of the most important functions include: creation and maintenance of low-salinity nursery habitats; provision of a medium for transport of beneficial sediments and nutrients; transport of allochthonous (external) organic materials from upland or delta areas; and control of the timing of movement of some estuarine species. This chapter also provides a list of 15 effects of reduced freshwater inflows noted in the scientific literature. Among the most significant impacts are: increased salinities and vertical stratification in the water column; penetration of the salt-wedge farther upstream allowing intrusion of predators and parasites of estuarine species, and increased intrusion into groundwater and surface water resources; increased frequency of benthic anaerobic conditions and decreased inputs of nutrient and organic matter used by estuarine species; loss of characteristic species and economically important seafood harvests; and increases in erosion of delta areas resulting from the reduction of sediment influx. Chapter 2 of the report reviews the legislation authorizing this study, provides an interpretation of the meaning of the phrase "ecologically sound environment," and discusses the steps needed to determine whether beneficial inflows are adequate to maintain an ecologically sound environment. The chapter identifies three general goals for the study, and also lists a series of eight objectives that were initially defined by representatives of the TWDB, TPWD, and Texas Natural Resource Conservation Commission. The specific objectives are: compiling inflow, hydrographic, and biological data into computer-compatible files; developing circulation and salinity models; evaluating the effects of inflow and salinity change on estuarine plants and animals; assessing water quality trends during the past 20 years; determining the effects of inflow on bay sedimentation and river delta maintenance; evaluating the effects of fresh water on primary production, nutrient loading, and biogeochemical cycling; preparing statistical inflow-harvest equations for commercial catches; and developing a methodology for analysis of inflow needs by optimization modeling. The third chapter describes the analytical approach used in the study. First, the hydrologic database for Texas estuaries has been extended through 1987 to include 11 more years of information. Then, specific studies of the effects of freshwater inflows on components or natural processes of estuarine ecosystems are presented. Important ecosystem components examined include salinity, macro-nutrients (nitrogen, phosphorus, and carbon), sediment, phytoplankton, seagrasses, marsh plants, zooplankton, benthic organisms, and larval and adult fish and shellfish. Abundance and distribution information are among the most important characteristics investigated for these ecosystem elements. Dynamic processes given detailed analysis include: photosynthesis; zooplankton production; nutrient uptake, regeneration, nitrification, and denitrification; larval transport; spawning and larval development of fish; metabolism of juvenile and adult fish with respect to salinity; and production of commercial species as measured by commercial harvest of species. The third step in the analytical approach is to develop and present an analytical procedure for determining freshwater inflow needs. There are several requirements for such an analytical procedure. It should give quantitative results on a monthly or bimonthly scale that is appropriate with managerial actions. The estimates should be realistic in terms of what kind of flows can be supplied. The method should focus on the maintenance of productivity, but should specifically address the concerns of salinity, nutrient, and sediment loading. It should be easily modifiable, efficient, and flexible, and should provide a method to check the results. The method will then be applied on a test basis to an estuary on the Texas coast. In addition to being a realistic test case, the analysis should show the breadth and scope of the effects of varying some of the elements of the analytical method, especially differences from altering management objectives and limits. Finally, the types of information and decisions that state policy makers and regulators must provide to use the method are presented. Chapters 4, 5, and 6 provide an analysis of the effects of freshwater inflows on Texas estuarine ecosystems. In Chapter 4, the patterns of inflow and salinity are examined for the Nueces, Mission-Aransas, Guadalupe, Lavaca-Colorado, Trinity-San Jacinto, and Sabine-Neches estuaries. Differences in inflow between these estuaries are dramatic and follow the precipitation gradient of the state. On average, the Sabine-Neches Estuary annually received more than 50 times its volume in freshwater inflow during the 47-year period of record. The Trinity-San Jacinto and Guadalupe estuaries received four to seven times their volumes on an annual basis, while the Lavaca-Colorado received about twice its volume, on average. Both the Nueces and Mission-Aransas estuaries received only 60 to 70% of their volume on an average annual basis, and the relative variation in inflow was higher from year to year than for the estuaries along the upper coast. Salinities were just the inverse of the inflow situation with lowest salinities in the Sabine-Neches Estuary and highest in the Nueces system. During the past 47 years, the Mission-Aransas Estuary had a statistically significant increasing trend in inflow. None of the other systems showed a significant trend during that long period. The Nueces Estuary had a decreasing trend of inflow (about 4% per year) from 1966 through 1987. A trend analysis for salinities from 1968 through 1987 showed decreasing salinity in the lower Sabine-Neches Estuary and increasing salinity for West Galveston Bay, lower San Antonio Bay, and Nueces Bay. The proportion of the nutrient load carried by the gaged flow of rivers compared to the total nutrient load varied from one estuary to another, in part because of differences in the relative proportion of gaged and ungaged areas. The combined inflow from gaged and ungaged inflow sources accounted for more than 52% of the nutrient load for the Nueces Estuary and more than 75% for the other estuaries. Thus, freshwater inflows provide the majority of the nutrient influx to estuaries. None of the Texas estuaries appeared to be nutrient limited; all had a decreasing gradient of nutrient concentration from the head to the mouth. High turbidities in the upper estuary and efficient regeneration in the lower bays allow nutrients to move through the system and be reused without contributing to eutrophication problems. While there are differences in the texture of suspended sediment loads of Texas river systems, sediment load is uniformly dependent on inflow. On examining cumulative sediment-cumulative discharge relationships, the Trinity River showed a definite change in the sediment load after the completion of construction of Lake Livingston, located upstream of the delta. Lake Corpus Christi retains 97% of the sediment entering it, and only about 70% of the sediment that formerly entered Lavaca Bay is now deposited there due to Lake Texana. The Nueces and Trinity river deltas are currently undergoing changes that can be attributed to the reduced sediment loads. In contrast, several other rivers showed changes in sediment load through time, but the changes could not be attributed to human activities; a number of sediment load changes occurred immediately after the drought period in the 1950's. While Chapter 4 is largely concerned with the abiotic portions of the estuarine ecosystems, Chapter 5 considers the primary producers (phytoplankton and plants), the primary consumers of production and detritus (zooplankton and benthos), the nutrient regeneration process, and the distribution and use of terrestrial and delta carbon throughout the estuary. Both phytoplankton and vascular plants (seagrasses and marsh vegetation) show responses to freshwater inflow. Under high inflows, flagellates often dominate the phytoplankton, while diatoms predominate during periods of low inflow and high salinities. Because of their longer life cycle, vascular plant response to freshwater inflow must integrate the effects of inflows over a longer period than phytoplankton. Inundation and salinity level are probably the factors resulting from inflow that most affect vascular plant composition; long periods of high or low inflow result in major population shifts. While productivity of all types of plants is probably influenced by freshwater inflows, it is difficult to measure directly because of the high variability in phytoplankton abundance and the ancillary effects of soil moisture, turbidity, epiphyte growth, and other factors on vascular plant production. The zooplankton community changes as a result of inflows. High inflows displace estuarine zooplankton, which are then replaced by freshwater species. As salinities increase through mixing and evaporation, freshwater zooplankton are replaced by estuarine species. On an annual basis, zooplankton abundance appears to be influenced by inflows, although the pattern is complicated. Zooplankton abundance is higher in years with greater-than-average inflows in estuaries that normally receive less than one bay volume of inflow each year. In estuaries that, on average, receive five or more bay volumes of inflow per year, increased inflow results in decreased annual zooplankton abundance. The different patterns of change in zooplankton abundance from inflow increases may be caused by opposing forces stimulating zooplankton production under low-flow conditions and displacing them under high flows. Benthic species also have a response to changes in inflow. Under high inflow, macrobenthic organisms adapted to low salinities flourish until higher salinity conditions return. The more marine species reappear and rebuild to higher levels that existed before the high inflow conditions commenced. Then, the populations decline to pre-inflow levels. A hypothesis for regulation of benthic species by inflows has been suggested and is still being tested by researchers. The rates of regeneration of nutrients by benthic organisms also seem to be related to inflow. They appear to increase both during and immediately after increased inflows, although prolonged periods of low salinity may kill many of the organisms that participate in regeneration. The nutrient cycling process, of which benthic regeneration is only one element, appears to change depending on the level of freshwater inflow. Those ecosystem components that use and store nitrogen assimilate higher levels of it during periods of high inflow than during periods of low inflow. But during times of high inflow, the efficiency of transfer of nitrogen between ecosystem components per unit of nitrogen input to the ecosystem is much lower than during low-flow periods when the material is cycled more times before being lost from the system. Inflows also transport and distribute terrestrial- and delta-produced carbon throughout the bays and estuaries. Studies on the Guadalupe and Lavaca systems showed a terrestrial carbon signal in the sediment and in the particulate organic carbon of the water column after large inflows. Analyses of benthic organisms, fish, and shrimp show that in some estuaries, the terrestrial materials transported by freshwater inflows directly or indirectly provide a portion of the carbon assimilated by organisms in their diet. This was particularly true for animals that lived in the upper bays close to the river mouth. Chapter 6 examines the relationships between freshwater inflow (as expressed by salinity) and the distribution, abundance, physiology, and production of fish and shellfish. Movements of larval species from the Gulf to the bays were studied to determine whether freshwater inflow provided a cue for their return after spawning and hatching. Transport of larvae was affected by tidal currents, on-shore wind, and tidal type (spring or neap), but no salinity- or inflow-related relationship was found. A study of the general distribution and abundance of larval and juvenile species showed that higher densities of juvenile shellfish were found in areas with lower salinities than is considered optimal for growth and survival. It also showed that salinity preferences or tolerances change with size (maturity) of the animals, although some species were less affected by salinity than others. Periods of high water associated with high inflows allowed some species (juveniles and adults) to move into inundated wetland areas and feed directly on detritus, benthic species, and epiphytes even though salinity conditions might be low enough to be substantially less than optimal. Many estuarine organisms move as close to sources of fresh water as their physiological adaptations will permit, probably in response to the detritus loads, plankton densities, and high levels of production of benthic animals in the area. The metabolic costs of ionic an osmotic regulation that result from living in an estuarine environment with a fluctuating salinity regime was presented for several estuarine adult and juvenile fish. At low and high salinity extremes, proportionally more of the metabolic energy of fish must be expended maintaining their internal ionic and osmotic conditions than at more moderate salinities. Therefore, at the extremes of salinity, the metabolic scope for activity such as migration or foraging is substantially reduced. This difference could be seen in both metabolic measurements and maximum sustained swimming speeds of various fish species. Juvenile estuarine fish tend to have a broader range of scope for activity than adults, but proportionally may have a larger reduction in scope for activity than adults as extremes, until they acclimate to the new conditions. Since some species are more numerous in suboptimal salinity regions of estuaries, the advantages of inhabiting low salinity areas must outweigh the considerable metabolic costs. In addition to influencing the active metabolism of estuarine animals, freshwater inflows affect the reproduction of estuarine species. Studies of reproductive females of two species showed that growth of the ovaries, particularly during the first 30 days of development, was reduced at very low and very high salinities. Egg hatching of spotted seatrout, which remain in the estuary for spawning, showed very little effect from salinity variation; eggs of Atlantic croaker, which spawn offshore, had reduced rates of hatching at high and low salinities, with maximum hatching at marine salinity levels. The effect of salinity on larval development for different ages of larvae was tested over a wide range of salinities. Spotted seatrout had the widest tolerance range, followed by red drum and then Atlantic croaker. These studies showed that salinity level is an important influence in fish reproduction; the adults of these species are mobile, however, so they can usually move to areas where salinity levels are favorable. While the effects of salinity on scope for metabolism and reproduction are clear, many adult finfish and shellfish are not as sensitive to freshwater inflow and salinity level as juveniles. Gill net data from several estuaries showed that there was no relationship between mean estuarine salinity and the density of (mainly adult) black drum, southern flounder, Gulf menhaden, striped mullet, red drum, and spotted seatrout. Trawls, capturing smaller individuals than gill nets, suggested that there was a relationship between mean estuarine salinity and density for a number of species; white shrimp and gulf menhaden abundance was reduced when mean salinity was greater than 25%; brown shrimp, small Atlantic croaker, and small southern flounder densities decrease at salinities of less than 15% or greater than 30%. In addition, literature and other measurements show that mean salinities greater than 25% reduce the density of eastern oysters. The relationship between commercial fishery harvest, a surrogate for productivity, and freshwater inflow was investigated using 29 years of shrimp data and approximately 26 years of data for other fishery products. Equations relating harvest to seasonal inflow, temperature, and harvest effort were prepared for all estuaries but the Laguna Madre where the hydrology was not complete. Results in the Sabine-Neches Estuary were poor due to unfavorable changes in estuarine conditions and discontinuous time series records resulting from shifts in the local fishing industry. Regression equations presented in the report accounted for an average of 69% of the harvest variation (range of 44 to 90%). While the statistically significant terms relating inflows to harvest seemed appropriate for many equations, for some, there was no clear biological explanation for the significant terms. Chapter 6 shows that through salinity control, inflows do affect fish and shellfish populations. The clearest effects were seen as physiological responses to salinity. The relationships become less clear, however, when they are not based on controlled laboratory experiments. Animals are free to move and select salinities. They go through life history changes as they mature, and are exposed to a host of other conditions in addition to salinity that could alter their survival. Consequently, the importance of freshwater inflows to fish and shellfish density or harvest is clear since it can still be discerned regardless of other influences on population density and harvest. Chapter 7 begins the second phase of the report by providing information that will be used in an example analysis of freshwater inflow needs for the Guadalupe Estuary. The estuary received an annual average combined inflow of 2,344,140 acre-ft. The maximum inflow in any one month was 2,457,912 acre-ft in June 1987, and the minimum inflow was 5,123 acre-ft in June 1956. Highest inflows are usually in May and June, with the lowest flows in August. About 82% of the combined flow is from gaged watersheds. A statistical trend analysis of inflows showed no significant changes in inflow in the Guadalupe Estuary during the 1941 through 1987 period, except from droughts. However, there are indications from exceedance probability charts that inflow during the 1968 through 1987 period has increased compared to the 1941 through 1967 period. It is possible that runoff from urbanization, return flows (originating form surface or ground water), or precipitation may be increasing, but the increase has not been detected by the statistical test. The chapter presents information on water quality and nutrient loading of the Guadalupe Estuary. In general, nutrient conditions seem to have been fairly stable during the period of record. Nutrient budgets for nitrogen, phosphorous, and carbon are included, based on extensive monitoring program measurements and modeling results from the TXBLEND hydrodynamic model. Budgets were prepared for a high- and low-flow year. Loading during the high-flow year was several times greater than during the low-flow year, as expected. Export of nutrients to the Gulf was also several times higher during the high-flow year. There were differences in import and export of nitrogen and phosphorous that may be related to difference in the biochemical processes that trap and release these materials. The proportion of phosphorous retained by the estuary was higher for a low-flow year than for a high-flow year, while the estuary retained proportionally more nitrogen in the high-flow year than in the low-flow year. More than half of the nitrogen flowing into the estuary from the river basin was lost to geochemical sinks during the low-flow year, but only about 16% was lost to sinks during the high-flow year. While none of the macro-nutrients appeared to be in short supply for plankton and macrophyte production, there was a greater excess of carbon and phosphorous than nitrogen. Consequently, nitrogen is closer to being a limiting nutrient than the other materials. Using inflow volumes and the nitrogen budget, a minimum freshwater inflow requirement of 286,000 acre-ft/yr was calculated that would be needed to offset the losses of nitrogen to biogeochemical sinks. The effects of inflow on sediment loading in the Guadalupe Estuary are assessed in Chapter 7. The lower delta that juts into San Antonio Bay below Mission Lake is undergoing an inevitable phase of decay and subsidence as the site of deposition has changed to Mission Lake. The upper portion of the delta above Mission Lake, which has existed in its present form for 2,000 years, shows no evidence of subsidence or deterioration. Sediment transport and deposition throughout Guadalupe, Hynes, and San Antonio bays is not understood well enough to allow a sediment requirement to be estimated for these areas. Consequently, a minimum sediment load estimate was determined for Mission Lake, to offset the effects of relative sea-level rise on the lake bottom and preserve the Traylor Cut subdelta, which is currently under construction. A sediment load of 132 acre-ft/yr of sediment must be transported to the estuary, which requires an annual freshwater inflow of 355,235 acre-ft/yr. The biological community of the Guadalupe Estuary is also described in Chapter 7. There are 29 dominant plants species, 12 to 31 dominant benthic species (which vary from year to year) and 30 dominant finfish and shellfish species. Based on salinity characteristics, the estuary could be divided into four zones: the upper estuary including Mission Lake, Hynes Bay, Guadalupe Bay, and the upper portion of San Antonio Bay; a mid-estuary region including San Antonio Bay down to Intracoastal Waterway; a lower estuary area including the lower third of San Antonio Bay and Ayres Bay; and Espiritu Santo Bay. The species that characterize each of these regions are discussed and the general salinity requirements for each area are presented. Salinity requirements were based on a combination of physiological tolerances from experimental studies and occurrence information from estuarine sampling programs. This chapter presents the two analytical techniques to be used for determining freshwater inflow needs. The first is a multiobjective optimization technique called the Texas Estuarine Mathematical Programming Model (TXEMP). This method can use stochastic representations of some of the inflow-dependent relationships. This analysis method uses quantitative inflow-salinity and inflow-harvest relationships as well as salinity limits for various regions of the bay, historical inflow information, harvest targets, nutrient and sediment inflow requirements, and other information to calculate month-by-month inflow needs based on predefined management objectives. The effects on fishery harvest of using different objectives and varying constraints are presented in the chapter. The results from the example analyses show how important it is for resource managers and regulators to select appropriate objective functions and constraints in determining freshwater inflow requirements. The TXBLEND hydrodynamic and conservative transport model is presented as a check of the inflow requirements. Compared to the hydrodynamic model, the inflow-salinity equations used in the analytical method described above are crude but quick predictors of salinity. The calculated inflows from the TXEMP Model are used as inputs to hydrodynamic model. Circulation and salinity patterns are calculated for the estuary using these inputs to determine whether salinity levels remain within the bounds necessary for maintenance of productivity. The example analysis uses calculated inflows and weather and tidal conditions from a dry year (1984). The inflow quantities calculated through this method are compared to three previous inflow estimates for the estuary that use various estimation methods. The final chapter of the report reviews the objectives that are presented in Chapter 2 and discusses how each objective was fulfilled in the study. In addition, general conclusions that can be drawn from the special studies and analyses are presented with special emphasis on the effects of freshwater inflow on salinity, sediment, and nutrient loading, and maintenance of productivity of fish, shellfish, and other estuarine life. The final chapter also describes the state of the analytical tools and the supporting information needed to apply the assessment method to the other Texas estuaries. Some enhancements and additions to the technique are presented for future improvement. The last portion of the chapter reviews the decisions that must be made by policy makers and regulators to allow the assessment method to be applied. Some of the decisions include overall management objectives in terms of species to be harvested and the relative value of one species compared to another; inflow bounds based on historical inflow records; salinity limits within different regions of the estuary; minimum nutrient and sediment loading requirements; fishery harvest targets; and chance constraints on statistical uncertainties.